Winter does a number on curly hair. The wind, cold weather, and various other elemental issues can create a mess of strands. However, you don't have to endure an entire winter hiding your curls under a cap or fighting frizz. Here's a wonderful DIY rice water spray for soft, shiny curls. Give it a try and let us know how you like it. Why use a rice spray? There are many products on the market that promise soft, shiny curls, but not many actually deliver. For curly girls who are monitoring what chemicals they put in their hair, DIY products are the way to go. The fermented rice spray will rebalance the pH levels on your scalp, making for a healthy environment for curl growth. It also adds shine and softness. 1 cup washed organic rice. Any color will do. 4 cups filtered or distilled water. Take a medium sized bowl and pour in 4 cups of the distilled or filtered water. Add in the washed rice. Mix until blended together. Cover with a lid, plate, or towel. Allow the mixture to sit at room temperature for 24 hours so the rice has time to sit in the water. Strain the rice out, pouring the remaining water into a clean spray bottle. You may notice the mixture has a sour smell, which is how it should smell. Now that you've made your product, it's time to use it! 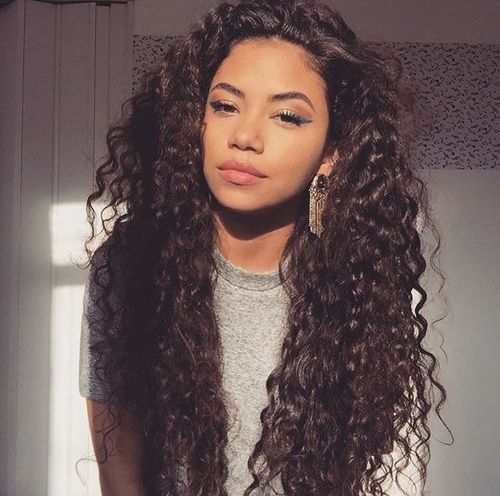 Spritz the rice water throughout your curls, paying special attention to your scalp. Once your scalp has been covered, spritz throughout the length of your hair. Massage into your scalp using the pads of your fingertips.